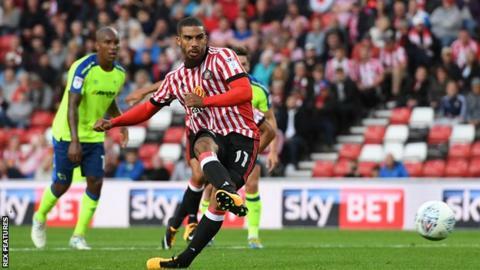 Sunderland came from behind to earn a point as they began life back in the Championship with a draw against Derby. The Black Cats finished bottom of the Premier League last season to end a 10-year stay in the top flight and fell behind when Bradley Johnson fired home. Summer signing Lewis Grabban equalised from the penalty spot just before half-time after Jacob Butterfield handled. Both sides could have won it, with Grabban hitting the post from 18 yards while Derby's Chris Martin fired over. Substitute David Nugent also had a late chance to earn the Rams all three points but could not connect cleanly with a volley. A point means Sunderland remain without a league win in August for seven years. But after winning only six Premier League games last season, new boss Simon Grayson would have been encouraged by their start. The Black Cats, who included six new signings in their starting line-up and midfielder Darron Gibson on the bench after he was filmed appearing to criticise his team-mates last weekend, were on top early on but fell behind to Derby's first attack when Johnson converted Johnny Russell's low cross from three yards. But Sunderland hit back and saw Scott Carson brilliantly tip over Lee Cattermole's fiercely-hit half-volley before Grabban coolly beat the Rams keeper from the spot. Derby, who gave starts to summer signings Curtis Davies, Andre Wisdom and Tom Huddlestone on his return to the club from Hull, controlled much of the second half but neither side could find a winner. "It is going to be a slow process but we've got to take positive steps and tonight we gave ourselves the platform to build up. "I haven't got a magic wand, I can't suddenly turn this club into a real positive, happy-go-lucky club playing free-flowing football - they've got to earn the right but it's about taking those small steps. "I am disappointed we conceded the goal but the biggest thing was we didn't crumble. Maybe this time last year the team might have gone under but they got back on the front foot and asked lots of questions." "We just couldn't find that final finish. Chris Martin missed one when you'd perhaps have expected him to do better, and David Nugent also missed a great chance. "I just felt we needed to be braver in the first half - we weren't brave enough and we looked a little nervy. But in the second half we showed a bit more composure. "I can't really argue with the penalty. I'm not going to stand here and say it wasn't a penalty, but it certainly wasn't intentional. He'd moved his arm towards the ball so I can understand why it was given." Match ends, Sunderland 1, Derby County 1. Second Half ends, Sunderland 1, Derby County 1. Attempt missed. Bradley Johnson (Derby County) left footed shot from outside the box misses to the right. Offside, Derby County. Bradley Johnson tries a through ball, but David Nugent is caught offside. Substitution, Derby County. Craig Bryson replaces Johnny Russell. James Vaughan (Sunderland) is shown the yellow card for a bad foul. Foul by James Vaughan (Sunderland). Attempt missed. Tyias Browning (Sunderland) header from the centre of the box misses to the right. Assisted by George Honeyman following a set piece situation. Brendan Galloway (Sunderland) wins a free kick on the left wing. Foul by David Nugent (Derby County). Attempt blocked. Lee Cattermole (Sunderland) right footed shot from very close range is blocked. Assisted by Aiden McGeady with a cross. Attempt missed. Billy Jones (Sunderland) right footed shot from outside the box misses to the right. Assisted by Lewis Grabban. Corner, Sunderland. Conceded by Richard Keogh. Attempt missed. Aiden McGeady (Sunderland) left footed shot from outside the box is high and wide to the right. Assisted by James Vaughan. Corner, Derby County. Conceded by Aiden McGeady. Attempt blocked. Matej Vydra (Derby County) right footed shot from outside the box is blocked. Matej Vydra (Derby County) wins a free kick in the attacking half. Foul by Didier Ndong (Sunderland). Substitution, Derby County. David Nugent replaces Chris Martin. Attempt blocked. Aiden McGeady (Sunderland) right footed shot from outside the box is blocked. Foul by Bradley Johnson (Derby County). Billy Jones (Sunderland) wins a free kick in the defensive half. Attempt missed. Chris Martin (Derby County) right footed shot from the centre of the box is too high. Assisted by Matej Vydra. Attempt blocked. Johnny Russell (Derby County) left footed shot from outside the box is blocked. Assisted by Bradley Johnson. Johnny Russell (Derby County) wins a free kick in the defensive half. Foul by Brendan Galloway (Sunderland). Foul by Aiden McGeady (Sunderland). Corner, Derby County. Conceded by Lee Cattermole. Foul by Tyias Browning (Sunderland). Substitution, Derby County. Matej Vydra replaces Andreas Weimann. Attempt saved. Johnny Russell (Derby County) left footed shot from outside the box is saved in the centre of the goal. Assisted by Jacob Butterfield. Attempt missed. Bradley Johnson (Derby County) left footed shot from outside the box is high and wide to the left. Assisted by Curtis Davies. Lewis Grabban (Sunderland) hits the right post with a right footed shot from the centre of the box. Assisted by Lee Cattermole. Corner, Derby County. Conceded by Brendan Galloway.